Say what now? I really don’t think that’s what any scientists did say, actually. Poor show, Karrie Gillett: your high school science teacher must be hanging hir head in despair. They’ve edited the article already. Yay for the Internet! Boo for accountability, as there is no note about the change, and arguments are now breaking out in the comments. This is not necessarily the worst news story about this research, as I’ve found several that insist this gene is important in human brain evolution, and not just that it could help explain it. I had a look at the paper in question, and failed to understand the abstract, so I find it hard to completely blame the journalist. OTOH, part of their training should be that if it sounds like “Missing Link!!!11!1!eleven! !”, they should probably ask a grown-up to explain it. 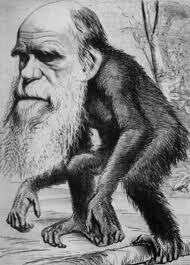 Yes, It is obvious in studying evidence that Chimpanzees evolved out humans. Chimpanzees now kill less other creatures than humans and Bonobos have taken it to the next step, make love not war. Obviously Bonobos, then chimps, evolved more quickly, since they eventually learned to survive on next to nothing, while humans couldn’t be happy even in magnificent mansions. paul, species can out-compete each other, but they can’t really out-evolve each other. Biological evolution doesn’t have any goals, it’s just a phenomenen that arises due to imperfect replication of gene strings leading to accumulated variations which are then filtered by the survival challenges of different/changing environments. Humans have definitely out-competed the other apes for dominance of acreage, but we have all been evolving at roughly similar rates. I thought Paul was being satirical. Anyways, I would be perfectly happy in a magnificent mansion, so I am a truly evolved human. Now, where’s my palace? Apologies if I misread you, Paul. It’s one of my pet peeve buttons. Tamara, you are a true sweet and gentle lady. Tigtog, I cannot conjure with one such as yourself being in possession of a peeve button, the two just don’t relate as they might if one were associating “bunyip” with “waterhole”, for example. Far from being offended, am actually humbly gratified that tigtog has gone to a painstakingly effort employing a semantic elaboration that may deeply improve readers contextualisation of this most intriguing of topics. Any way, wouldn’t being a Bonobo be more fun even if not more “evolved”- phooey to evolution if it is breeding out the fun teleogically. Paul Irving: you don’t need to understand the paper to know that humans are not descended from chimpanzees. I provided the link so that others could check that indeed, the scientists do not make that claim. Indeed, Aqua. Hence my snarky comment about seeking the advice of an adult. Aqua of the Questioners, I also wish that news articles routinely included links to sources. If lowly bloggers can do it, why not “legitimate” news media? Perhaps they think/are hoping that their readers/viewers are too stupid to understand the original or catch their errors in interpretation? Imagine comments that consist mostly of things like this blog post.